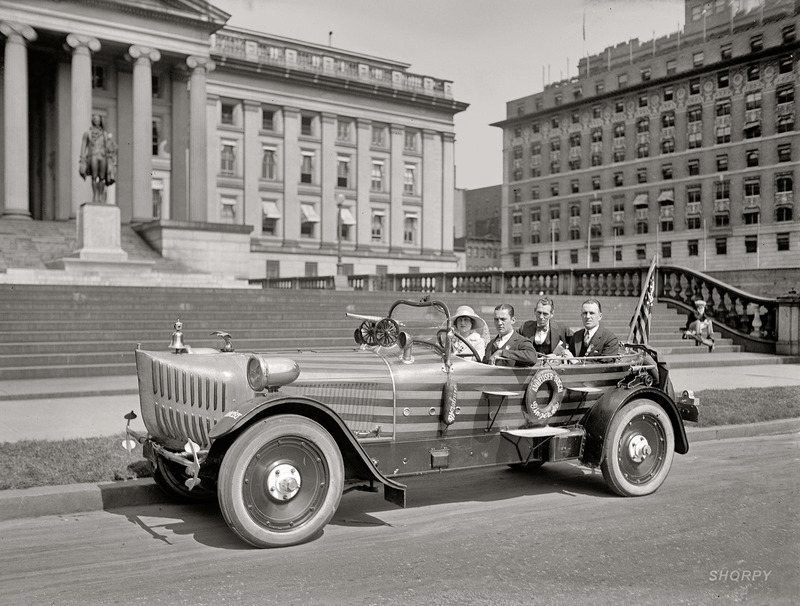 "Eagle-eyed Dorris owners suggest the vehicle’s chassis was not built in Buffalo, and was actually constructed in St Louis by the Dorris Motors Corporation. Although surviving pictures reveal a set of small Dorris hubcaps on the vehicle, it doesn't prove that the chassis was built by the same manufacturer. It's more likely that the caps were added by Anheuser-Busch's mechanics to hide the real identity of the chassis." Also note the hood louvers & latches, the hood top vents & hardware, the air compressor door below and forward of where the driver's door would normally be, the fender shape, and the steering wheel and center controls that EXACTLY match the early 20's 6-80 model. [Shorpy] has a higher resolution picture of this vehicle.